A cozy home away from home. All photos courtesy of San Domenico House. What happens when you bring Italian hospitality to a quiet London neighborhood? LONDON – London may be the ultimate hotel town — with everything from luxurious, chintz-filled suites to bijou, boutique bolt holes — but there are surprisingly few options in SW3, the quiet residential area near Sloane Square in Chelsea where I used to live and prefer to stay. Needless to say, I am always happy to make a lodging discovery. My latest find isn't brand new, but it is under the radar due to its small size and low-to-no traffic location. My new home away from home is , an authentic, antiques-laden English charmer with a Puglian twist. San Domenico House is a 17-room red brick Victorian home that was purchased in 2005 by the Melpignano family and lovingly transformed into a cossetting guest house just steps from the King's Road. (The same family owns Popupla Favorites Borgo Egnazia and Masseria San Domenico, five-star resorts in Puglia that are at the opposite end of the design spectrum.) Built in 1887 and established as the Sloane Hotel in 1991, the latest iteration of the hotel is a rare, slightly quirky find – making it ideal for travelers who like this part of town, favor peace and quiet, like to open the windows, or are traveling with older kids who will love the easy access to the shops, cafes, and parks of Chelsea. 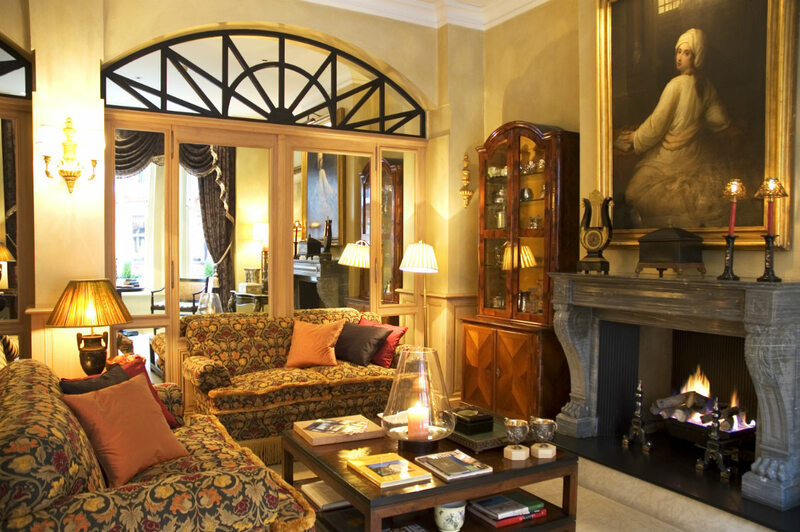 Spread across four floors, the rooms and suites are all individually designed, some with antique armoires, others swathed in toile du jouy fabrics. Some are bi-level; some have lovely terraces. But each makes guest feel like they are staying in someone's well-appointed house, with en-suite, modern bathrooms. Rates start at £195. Click . 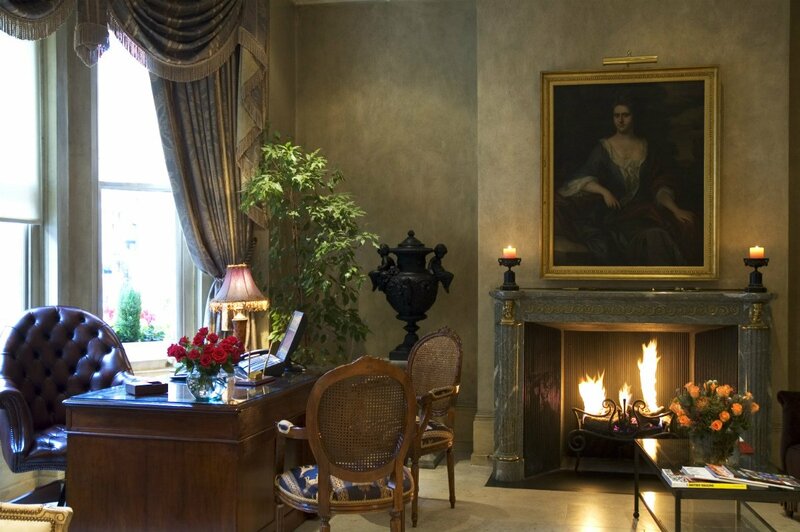 San Domenico House is known for the art and antiques that have been lovingly curated by the elder Mrs. Melpignano. The public sitting room — sumptuous couches, serious oil paintings, roaring fire — is period perfect, so warm and inviting that I spent a Sunday morning reading the papers as natural light streamed in through the enormous, original windows. Another point of differentiation is the staff: They're all Italian, and most from the same town in Puglia. This adds a sweet aspect to a stay here. Everyone is eager to please, to try their English, and to make you feel a part of their family, if only for a short while. This is primarily a place to (peacefully) lay your head. No swanky bar and no spa, but there's a sweet breakfast room on the lower level. The staff takes great pride in serving everything from full English breakfasts to egg white omelettes (with a bit of translation required). 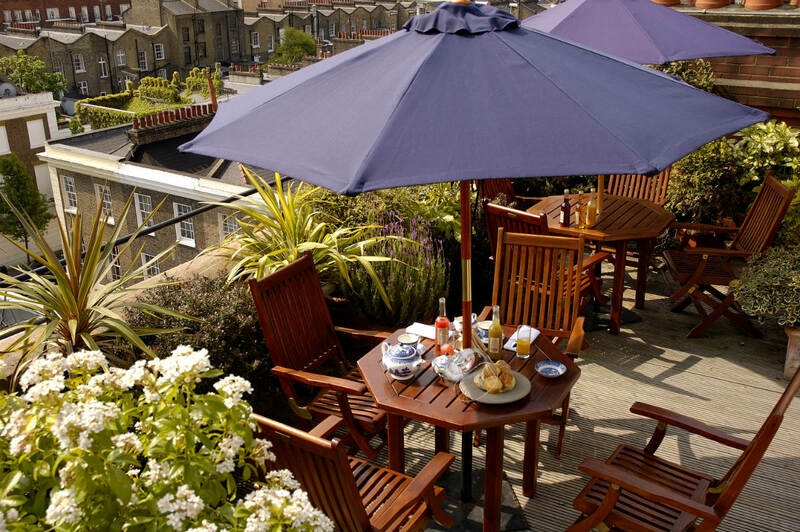 The Deluxe Suite has a terrace overlooking the iconic townhouses and chimney pots of Chelsea. For my money, there's no better spot to enjoy a summer breakfast. The breakfast offerings are excellent — fresh fruit, flaky croissants, and seriously strong coffee — and the sweet waiter will source whatever they don't have on hand (in my case, an icy Diet Coke which I think he had to run to the Sainsbury's to get, yet another gracious touch). Afternoon tea served in the main sitting room feels quintessentially English, right down to the overstuffed chairs and collection of antique silver. Lunch and dinner are available as is a nice room service option for late arrivals. The neighborhood has so many wonderful restaurants, from delicious Lebanese holes-in the-wall to fine dining establishments, that you'll want to walk the 500 yards to some of London's best meals. There are 17 rooms in four categories. 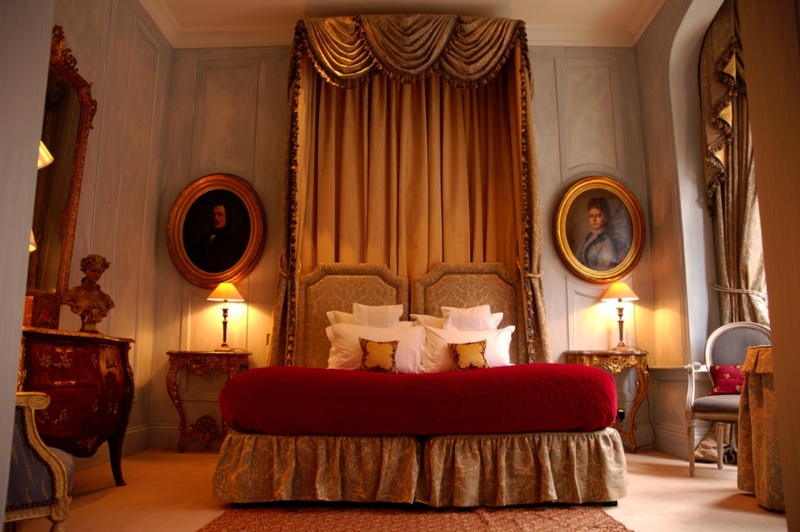 All have high ceilings and marble bathrooms; most have enormous bay windows, opulent draperies, and precious antiques. The Deluxe Suite is the top of the line, followed by Junior Suites decorated with vintage Louise Vuitton cases and gilt-framed paintings. Gallery Suites have a slightly regal vibe — velvet curtains with silk tie-backs, four-poster beds, and lots of rich red fabrics — while Deluxe Doubles have been designed in lighter palettes of cream and beige. Central air conditioning (still not the norm in small hotels), free WiFi, small flat screen TVs, and Molton Brown amenities round out the spare but practical room offerings. Anyone who appreciates local color, Italian warmth, and good cheer. Just step outside the front door to see children going to nearby schools and people walking to the market. This is real London life, not busy, polished Mayfair. It's also perfect for anyone looking for an affordable, old-school weekend away or proximity to the shops and restaurants at the Brompton Cross. People with small children. You're living in close proximity, and no one needs the noise. Also not ideal for the sybarite in need of shiny, endless amenities, e.g. an on-site gym, vast room service offerings, or anyone with an aversion to heavy, slightly baroque décor. Consider this a very upscale B&B where you get real value for money. Shake the London chill by the fire. Chelsea is understated, well manicured, and definitely not the epicenter of the action in London. That said, it is full of beautiful architecture, particularly the white Georgian row houses with their colorful doors, and is also home to lovely parks and excellent restaurants. Staying in this part of town gives you a more local look at London life, and it's an easy jumping off point to nearby museums including the and the , the shops of Sloane Street, as well as the extremely cool . Shopping is a major Chelsea highlight, and one of the best stores (anywhere) is the on Sloane Avenue. Not to be confused with the more mass Conran stores, this one-off is a highly edited, design-led emporium full of Eames and Saarinen furniture and the best letterpress cards, gifts, and accessories anywhere. Ideal for holiday gifts and stocking stuffers. Just steps away is the original boutique, a highly curated, multi-brand store with amazing fashions as well as practical pieces (pants and their signature sweater collections) at the annex across Walton Street. Strolling the King's Road is a must, and is perfect for affordable vintage things, like Art Deco match strikers and silver picture frames, while in Duke of York Square has beautiful art and fashion-centric tomes. is a must for desk accessories, as is for snack foods. The massive is the place for practical, Union Jack-bedecked things. Grab a picnic at (prepared salads and sandwiches) and head for the slightly secret or the . Or have a light lunch at on Draycott Avenue. The best of this chain of restaurants, the Chelsea outpost has table service and a vibrant atmosphere. Other foodie highlights include , noted chef Tom Aiken's comfort food spot; for stylish breakfast, lunch or dinner with Italian flair; and for celebratory lunches involving oysters. For excellent Lebanese food, I love on the King's Road, where the chicken schwarma more than makes up for the ambience. For the best steak frites in town, go to , where the service is quite French. For a casual coffee or a light lunch, is the place. Sit at a farmhouse table and order beautiful salads and baked goods, notably their enormous, signature meringues. This is a hip, farm-to-table spot that could easily flourish in the Berkshires or Williamsburg. Chelsea closes early. Restaurants are finished by 10 p.m. and the streets get extremely quiet. On the side, the gastropubs are excellent ( and are my favorites), flower vendors like are abundant, as are endless places for coffee including the café at , , and .